Please note this page is for a previous festival. Click here to view the most current festival information. Welcome to the 1st Annual Reel Fun Film Festival! We are thrilled to present an extraordinary selection of films - many of which we are premiering at RFFF!!! These films are guaranteed to engage, entertain and educate students, teachers and parents alike. 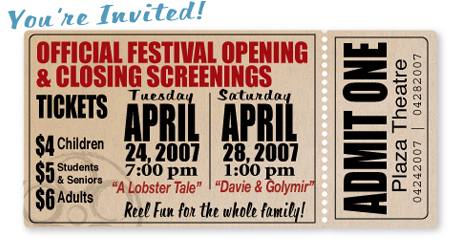 You're invited to our Official Opening & Closing Screenings of the films "A Lobster's Tale" and "Davie and Golymir" at the Plaza Theatre. Tickets available at the theatre, or click here for more information. Note that all school screenings are open to the public for attendance - public screening ticket prices apply to non-school participants. We are excited to offer a great lineup for students grades K-12 showcasing quality curriculum linked films that will provoke discussion and will promote students to go beyond the classroom and experience stories and issues from around the world. Browse our site to find out more about the Festival, learn about the films we are showing, or download the study guides and other materials we have available.